Are you reaching your potential as a conference producer? Think about it. You fly around the world to run million dollar events at luxury hotels and resorts. Billion dollar companies pay to share the spotlight on programs that you conceive and create. You cut through hype and headlines to highlight the issues that professionals work on when they roll up their sleeves. Several hundred executives and business leaders listen eagerly as you bring experts on stage to share insights. Guests pay thousands of dollars and spend weeks out of the office to share in your vision as it comes to fruition. Buy your copy of Producing Success now! Imagine that feeling of being on stage in front of hundreds of interested people, knowing that your event is a success. Or having a world-class meal in a destination city while sharing jokes with satisfied clients and coworkers, friends all. Think about watching your speaker list grow, securing a high profile sponsor, or asking the hotel representative to get more chairs because the current session is standing room only. You have great power and influence. So ask yourself: Are you making the most of this career? This is what producing a successful conference is about. You’ve been looking for ways to move forward. To bring your career to the next level. A way to find the freedom that comes with being a highly skilled, multi-faceted professional. If you’re a career minded conference producer, Producing Success: A Career Guide for Conference Producers is the only book specifically written with you in mind. It offers insights and observations gleaned from over a decade producing content-driven industry conferences for independent events companies. People in careers ranging from public relations to enterprise sales have also found value in this one-of-a-kind book. You will produce a successful career when you learn to: Organize and nurture your professional contacts – your people are your most valuable asset. Develop a Hollywood ready stage presence as a public speaker – put your own stamp on your events so people remember, while the rest blur together. Write copy that both educates and influences industry connectors who matter – plant the seeds for word of mouth promotion, the most valuable kind! Producing Success highlights the rich experiences that lie within the madness. Each chapter suggests resources for further reading and training, as well as exercises that help you expand your outlook and improve your skill set. Producing Success is a critical tool for producers looking to open new doors, develop a vision, and put your imagination, creativity, and positive attitude to work for you. Engaging and relatable, there is no other book like it for conference producers. 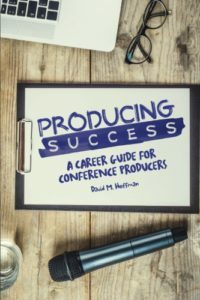 Buy Producing Success: A Career Guide for Conference Producers now because 2018 is the year where you bring everything to the next level!